I have never been an expert on the black metal genre, but I do know that Norway, Canada and Australia boast bands that just aren't to be fucked with. Bestial Summoning, on the other hand, is a band that hails from the Netherlands, a country better known for death metal acts like Asphyx and Pestilence, as well as thrash bands like Dead Head and Occult/Legion of the Damned, so my expectations honestly weren't that high upon my first listen of "The Dark War Has Begun." Whether or not having set the bar lower for this record had any effect on my perception of it, I don't know, but I do know that these guys aren't to be taken lightly, sounding like they couldn't decide whether or not to embrace the atmospheric tendencies of the Norwegians or the sheer brutality of the Canadian blasphemers. If I were to sit here and describe one song for you, the same could be said for the rest of the tracks. All of the songs feature some fast black metal styled tremolos backed by incredibly ferocious drumming. And just about every track has a doomy break or features some chords that awaken a sense of dread, courtesy of the amazing guitar tone which invokes a dark feeling that the Norwegians excelled at. 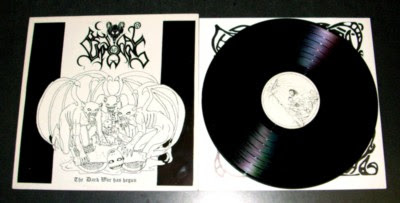 The blending of the two different archetypes for the black metal genre worked out brilliantly on "The Dark War Has Begun," because despite the constant repetition throughout the record, the listener can be treated to the raging fury of the Blasphemy-like madness, as well as the more sinister material that shares more common interest with bands like Mayhem and early Immortal. The most standout part of Bestial Summoning's music would definitely have to be The Unsane's vocals. This dude sounds pissed, almost like he had been caged by some religious group, only for him to eventually become unhinged and release his anger as well as his love for the unholy (Listen to "Give Me Your Orders" and "Enjoy Your Death for Satan") to the very unwilling masses. I wouldn't say that this album is the best black metal album to ever cross my path, but it is definitely a fun one that comes with all of the evil, the darkness, and the hilarious band names that I have become accustomed to and serves as one that any black metal fan should check out. "Enjoy Your Death for Satan"